DC Home and Condo Prices: A sign of the times? Or, maybe, "it can't happen here?" I love primary colors. I've driven a convertible since 1995, first a Miata and now something a little more expensive. When buying each car, I adhered to my father's admonition: "A convertible should always be a primary color." Miata: red. New car: black. Why do I talk about primary colors here? Well, let me tell you the sign at right, attached to the hurricane fence in front of 1706 T St NW, was quite an eye catcher this evening; I couldn't help seeing it as I parked on T St to go to the gym. I wasn't the only one who noticed - quite a few folks stopped to look at the sign as they passed by. The property's 2007 assessed value is $1.5MM. The District's proposed assessment for 2008 is $2.8MM. It appears the tenants bought the property in May 2006 for $3.1MM. Taxes grew from $9200 in 2005 to about $13,600 for tax year 2007. They still owe for the second half of 2007. Obviously, I'm not privy to the details of the purchase, and it appears quite convoluted when looking at the transactions listed in the Recorder of Deeds database (the Unitarian Universalist Affordable Housing Corporation, now the Open Door Housing Fund, was involved), but on the face of it, it appears the tenant's overpaid for the property and they're now in arrears, hence the primary colors parked in the front yard. 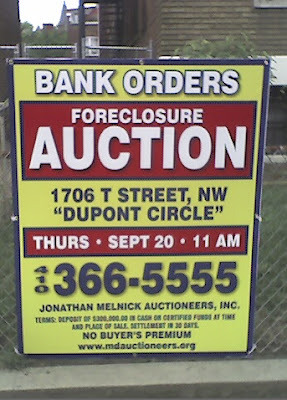 Given current market conditions, I wonder if we'll see more signs like this in the District. I'd be curious to see more about these "auctions." This one at least says "no buyer's premium" which is a fee of up to 10% that the buyer has to tack onto the swale. The auctioneer tells the seller "You don't pay anything, the buyer pays." As if the buy that is willing to pay $500,000 won't stop at $455,000 because of that fee. The only real auctions are "NO RESERVE" auctions that don't have a minimum price. All these others I think are just marketing ploys to find parties that are remotely interested. I'll be blogging about this shortly. Thanks for the post, maybe do a follow up after the auction! The building sold to Urban Investment Partners for $3.3 million. Thanks for the update. I'm interested to see what they'll do with the building.